A must read and a new listen…my interview with Dr. Gary Chapman! Anyone else read Dr. Gary Chapman’s The 5 Love Languages or one of the spin-off versions? I can’t tell you how many times this information has helped me in all sorts of relationships. 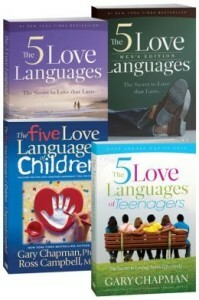 For parents, I particularly recommend The 5 Love Languages of Children and The 5 Love Languages of Teenagers. These have been instrumental in teaching me how my own children give and receive love. 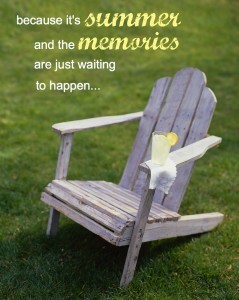 For more valuable resources, see www.5lovelanguages.com. As an author, it doesn’t get much better than being asked to have an interview with an writer whose work has been so influential in my life! Recently, I had the honor and privilege of being a guest on Dr. Gary Chapman’s radio show, Building Relationships with Dr. Gary Chapman. What a joy it was to speak with him and personally share how much his writing has meant to me! And, what a thrill to hear how much he appreciates my book! Gonna be in the car a while, doing laundry, or working out? Click here to listen online if you want encouragement, ideas, and practical help for learning how to parent with Scripture. You’ll even get to practice by putting yourself in the shoes of another parent as I challenge you to think through what you would do and teach the easy steps to parenting with Scripture. 6 Ideas for Summer Fun with Scripture! I thought I’d touch on some oldies, but goodies today and also let you know what to look forward to! Happy Memorial Day! For those with older children/teens, you might find it interesting to read and discuss the poignant true story I mentioned in this Memorial Day blog from last year. If you have plans to go on vacation or have a staycation, don’t forget about Vacationing with Scripture and that the memories and teachable moments it creates are more valuable than any souvenir you could bring home! 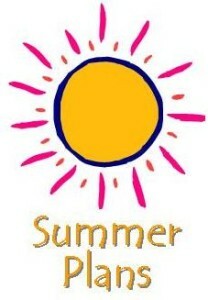 Many of you are newer subscribers and didn’t see my Summer Fun Series from 2012. 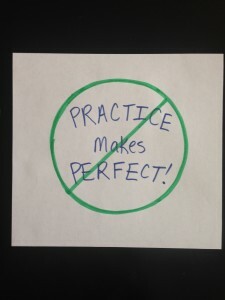 And, don’t forget to keep an eye out for those teachable moments that pop up! Keep your copy of Parenting with Scripture: A Topical Guide for Teachable Moments handy. Do you have a favorite way to “play” with Scripture? Please share in comment section! Toddler Kalli looked at me sternly and yelled, “Go away!” complete with shoving motions. Oh my! Wherever did she learn that?! I soon found out. It was from her daddy and a Bible story! 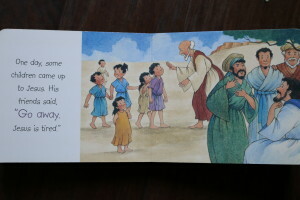 They had come to the part of the story where children were coming to Jesus. The book says that His friends said, “Go away” and they had been really getting into the part! Ha, it took a simple correction of just reminding Kalli that we don’t talk that way to other people. But, my take-away was the value of turning a simple preschool Bible story into an active learning time! Here’s how Tim did it. (Suggestions are page by page)*Hug yourself to show how much Jesus loves us. *Walk in place going to church for Easter. *Point and count the 12 disciples. *Say, “Come on!” and make “come here” motions with your hands. *Rub tummy like hungry. Count rolls and fish in picture. *Say, “Here ya’ go!” and pretend to share with your hands. *Read the words and encourage your preschooler to repeat along as well. This is based on 1 John 4:19. With repetition of this book your little one will have learned this Bible verse!